The Arab spring is a revolutionary movement empowered by the strength of individuals, communities, and rise of technology. The influx of citizens in the country of Tunisia, Syria, Egypt, and many others opposed their governments dictatorship. These government leaders violated human rights, promoted political corruption, economic decline, unemployment, and a record causes that inclined citizens to revolt in such a manner against their leaders. This grew from individuals to communities, to other countries participating in the rebellion as well, as fight for justice and freedom in retaliation to corrupt governments. Though the Arab Spring had many reasons for such an uproar, a common reason for the Arab Spring was a desire for democracy. In most of the countries affected by the movement, autocratic (nondemocratic) leaders had been in place for years. As the people of these countries began to grow weary of corruption and the lack of support, they revolted. The Arab Spring was led by young people, many of whom used social media to communicate and organize with people in their countries, and other around the world. This would revolutionize many of these countries for better or for worse, but overall, gave these individuals a voice to stand for what they believe in. As rebellions and protests continued throughout the years, many lives were lost due to these governmental injustices. Individuals in countries such as Tunisia, Egypt, and Syria, may have been able to over throw some of their authoritative leaders, but many are still fighting to this day in 2014 to strive for the justices they as humans deserve. We will start by looking a brief overview of some of these major countries, and with the interactive map provided, some information regarding all countries involved in the Arab Spring. The next few page will give some in-depth views on what some of these countries had to face, and the tyranny that many witnessed to strive towards a state of justice. NewsMappers. "Map of The Arab Spring Protests." Tripline. Tripline, 2012. Web. 16 Nov. 2014. As the Arab Spring began in late December 2010, the most significant element of Tunisia’s Spring is frequently symbolized by Mohammed Bouazizi. Bouazizi was a fruit vendor who at the time lit himself on fire as a sign of protest of the regime. Other contributing components included the fraud and lack of free press; the leader of Tunisia gave authority to himself, which in turn resorted to subordination to accomplish goals. After weeks of antigovernment demonstrations and protests, President Zine El-Abidine Ben Ali resigned and fled to Saudi Arabia. Ben Ali had ruled Tunisia unopposed since 1987. The Tunisian protests were at sometimes violent, were about 300 people were killed. In January 2011, antigovernment protests erupted across Egypt. The majority of protestors were the jobless Egyptian youth who were able to use social media to effectively organize demonstrations. Social media helped them to stay one step ahead of the authorities until Hosni Mubarak was forced to resign. Protesters called for an end to the presidency of Hosni Mubarak, who had led Egypt since 1981. Mubarak stepped down in February 2011 and handed power to the military. Egyptians voted in a series of elections that began in November. In the early months of 2011, government forces killed more than 800 people while trying to suppress the protests. Antigovernment protests erupted in March 2011 in several Syrian cities. There were protesters who were asking for more rights on political freedom, the release of political prisoners, and the removal of President Bashar al-Assad. Bashar has been in power since the death of his father in 2000, and has refused to step down. Bashar refusal led to unrest within the people. This eventually escalated into an armed revolt costing thousands of lives. Bashir al Assad’s decision to use chemical weapons against the people caught the US’s attention and forced him to destroy these. The fight for power connecting the rebels and the government have been frequently varying and resulting in thousands of deaths. Neither is willing to step down and peace conferences are still being planned for this year in 2014. 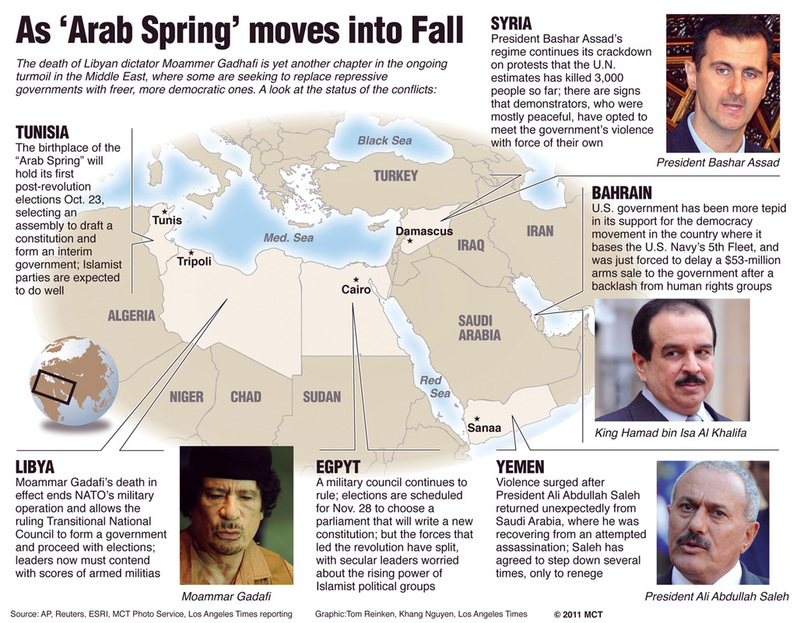 "Arab Spring." Funk & Wagnalls New World Encyclopedia (2014): 1p. 1. Funk & Wagnalls New World Encyclopedia. Web. 15 Nov. 2014. 2012. Web. 16 Nov. 2014. "Bashar Hafez al-Assad." Bio. A&E Television Networks, 2014. Web. 16 Nov. 2014.